Chitchat Why no one post MRT colision this morning? 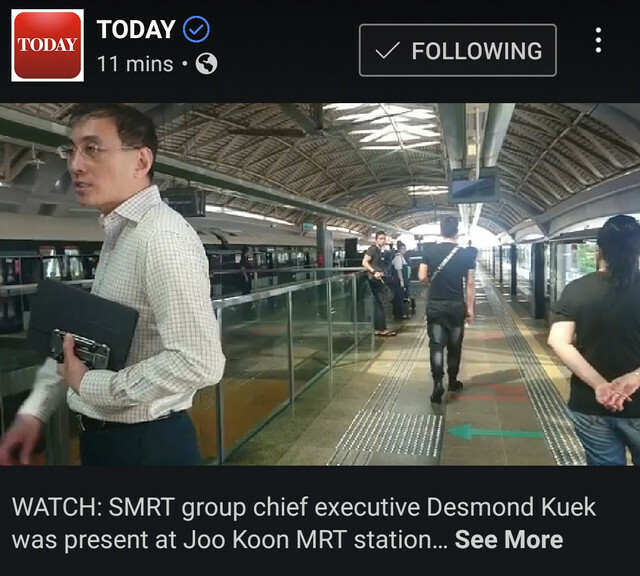 Innot see any thread of this morning’s MRT collision at Joo Koon is it SBF members all own cars? This will be the reason for PAP to lose the next election. No worry one-parliament will clear all the politicians who will continue to enjoy the highest salaries in the world with pension. You mean oneself check oneself? Yes this is the new norm now. Won’t la. 70% are forgetful and forgiving. May them be on the next train that flips. Hey before you kenna sued. It is "ownself check ownself" not oneself. Bad engrish not accepted sini. no one post anything this morning because Mrt breakdowns are no longer news. Just like rapes in india. Nabeh, you drive Lexus around the island to find fault with MRT. It's a once in 24 years natural phenomena, no PAP members will be blame except for the SMRT maintanance team. This morning at 8.18am, a train heading in the direction of Tuas Link Station stalled at Joo Koon Station. At 8.19am, a second train stopped behind the first faulty train. At 8.20am, the second train moved forward unexpectedly, and came into contact with the first train. 23 passengers and 2 SMRT staff sustained light to moderate injuries, and have been conveyed to Ng Teng Fong Hospital and National University Hospital. SMRT and LTA are investigating the incident. This is not a driverless train. WTF was the driver doing? Or brakes failed? So how few/many black sheep involved in creating this mess? Income opportunity for Insurance sales. Buy insurance for every mrt rides. Dont know what will happen on your next mrt ride. Sekali insurance companies also dont dare to accept. I takel my words back and apologize vehemently - this is not a collision, officially this is only a “CONTACT” between trains. Forum moderators please delete this thread before I get sued. Sorry hor in Singapore I’m just another peasant taking MRT hor. Where got so rich can afford a car in Singapore?